If she is is damaged, Empress Fu can compete with another character at the beginning of their turn. If she wins, they skip their action phase. If she loses, she is one distance away from the target for that turn. When Empress Fu is attacked, she can select any third character that has a hand card. This character must show a card and give it to Empress Fu. If the given card is not an Escape, they are also targeted by the Attack. "Anxious Fear" takes place before the target's judgment phase. If she wins, the target loses their action phase. The other phases of their turn still take place. 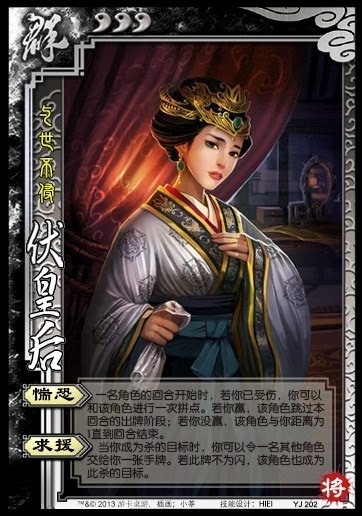 Empress Fu cannot target a character with "Anxious Fear" if they have no hand cards at the beginning of their turn. Empress Fu cannot target a character with "Plead" if they have no cards in their hand. She also cannot target the source of the Attack with this ability. Empress Fu seems to be very reminiscent of Da Qiao. Both characters have an ability that deters other players from attacking them ("Plead" and "Displace") and an ability that has a chance of skipping another player's action phase ("Anxious Fear" and "Country Scene"). Like Da Qiao's "Displace," Empress Fu's "Plead" is such a strong deterrent that enemies rarely attack her and she has few opportunities to activate it. In fact, when Empress Fu is at full health, she cannot activate "Anxious Fear" either (the power specifies that she must not be at full health). This seems to be a major weakness for Empress Fu, because the enemies can prevent her from being useful by simply leaving her alone. However, if an ally attacks her, Empress Fu can target an enemy with "Plead," take the damage from the attack, then use her cards to activate "Anxious Fear" to prevent enemies from taking her turn. To use Empress Fu effectively, it is necessary to communicate with your teammates.